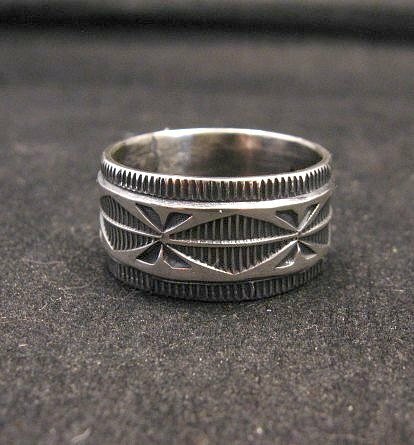 Here's another innovative Navajo handmade sterling silver ring created by Travis Teller. Travis is the son of famous Navajo silversmiths, Everett & Mary Teller and he has become an accomplished silversmith in his own right. 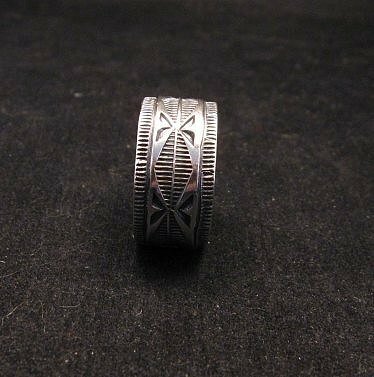 Travis told me he takes the designs for these rings from traditional Navajo sash belts. The ring is completely hand stamped all the way around. 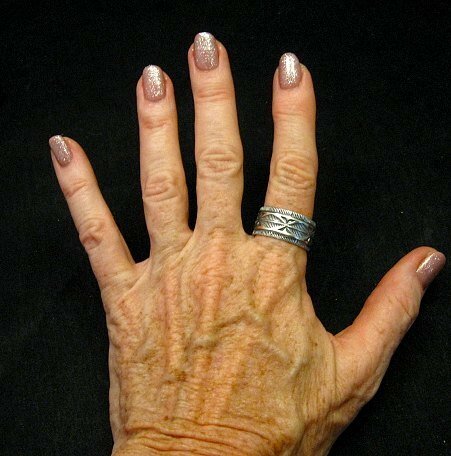 The solid sterling silver ring measures 7/16 inch wide and weighs 10 grams. Size 10-1/2. Nice unisex ring. Brand new and in perfect condition. Purchased in person from the artist, Travis Teller. The hallmark is a family mark which the entire family uses now. EMT inside a fish. Gift box and Certificate of Authenticity included with your purchase.